Resilience will be a key aspect to address in future-generation 5G photonic networking, mainly due to the stringent quality of service (QoS) requirements of 5G services, e.g., latency, availability, energy efficiency, transport capacity, IT resources, etc. To cope with this issue, an optimized resource planning and management of photonic networks and systems is necessary. The scope of the special issue has been well received by the research community. A total of 13 contributed papers have been submitted to the special issue, out of which 6 high-quality papers have been accepted after being peer-reviewed. In addition, 6 invited papers have been also included in the special issue. The invited papers went through the same thorough peer-review process of the contributed ones. As a result, the special issue consists of a total of 12 papers. Their content is briefly summarized in the following. 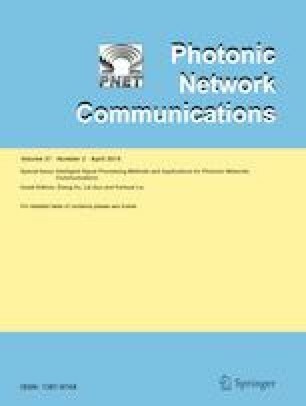 In paper “Exploiting Efficiency of Ultra Dense Wavelength Switched Network for Carrying Metro Network Traffic (Invited),” the authors focus on the Ultra Dense Wavelength Switched Network (UD-WSN) paradigm as a promising candidate for resilient 5G metro network technology, investigating on its cost–performance trade-off. The authors of paper “An Optical Packet Metro Architecture for Fixed Mobile Convergence in the Cloud Era (Invited)” propose optical packet switching (OPS) as a promising candidate to support future services in Metro Area Networks. An SDN-compatible flow-based transfer mode is applied in this context, and the authors study its effectiveness for supporting local and global repair in case of failures. In paper “Resilience–Throughput–Power Trade-off in Future 5G Photonic Networks (Invited),” the authors exploit the concepts of interleaved networks and cooperation of multiple operators to provide resource redundancy, so as to increase network resilience while mitigating deployment costs. Paper “A Programmable Optical Network Testbed in Support of C-RAN: A Reliability Study (Invited)” provides an experimental study, where a programmable optical SDN-based testbed, supporting backhaul/fronthaul transport, is upgraded with a 1 + 1 protection mechanism at the Ethernet layer. The authors of paper “A Comprehensive Optical Mobile Fronthaul Network Towards High-Fidelity, Flexible and Low-Latency Transport (Invited)” concentrate on a variety of interesting aspects in Cloud-RAN, such as modulation formats adopted in fronthaul transmission, flexible RAN splits, optical switching fabric architectures and dynamic bandwidth allocation mechanisms. In paper “Coexistence of OFDM and FBMC for Resilient Photonic Millimeter-wave 5G Mobile Fronthaul (Invited),” the authors propose the transmission of multiple mmWave signals as a means to improve resilience in a multi-service/multi-operator fronthaul network. In “Integrated Resource Optimization with WDM-Based Fronthaul for Multicast-service Beam-forming in Massive MIMO enabled 5G Networks,” the authors investigate on the optimal wireless/optical resources allocation in next-generation radio access networks (NG-RAN) and propose a flexible WDM-based fronthaul architecture to support high-capacity and resilient transport. On a similar way, in paper “Quality-focused resource allocation for resilient 5G network,” different algorithms have been developed to perform the wireless resources scheduling to end users, based on the required QoS and targeted resilience level. Resilient placement of baseband processing units (BBU) has been studied in paper “Centralized vs. Distributed Algorithms for Resilient 5G Access Networks” to protect against processing (i.e., BBU nodes) failures, and in paper “Resilient BBU Placement in 5G C-RAN over Optical Aggregation Networks,” where protection against link failure is also addressed. An interesting experimental activity has been described in paper “Performance Evaluation of SDN-Controlled Green Mobile Fronthaul Using a Federation of Experimental Network Testbeds.” The authors evaluate the ability of an SDN-based control to reconfigure the fronthaul traffic in order to guarantee network availability, i.e., maintain connectivity between virtual network functions (VNFs) in a virtualized-RAN environment, in case sleep-mode procedures are activated for energy efficiency purposes. Concentrating on the physical layer, in paper “10 Gbps CPRI signals transmission impaired by intercore crosstalk in 5G network fronthauls with multicore fibers” the authors perform a simulative study to evaluate the outage probability of fronthaul flows in multicore fibers affected by intercore cross talk. We hope that the research community will find this special issue interesting and stimulating for new research direction within the topic of resilience in 5G photonic networks.